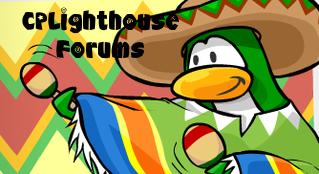 Welcome to The CP Lighthouse! Have fun! Well, I think that you sould not count the views that are by the same person. Just saying so if the views make a matter. Sorry if I wasted your time! Well there's not really a way to do that. It just counts how many times this topic has been viewed. It kinda keeps track of how popular it is for example if it only counted a person once then it would be weird because it would have like 7 views and a bunch of replies. Good suggestion though. Jump to: Select a forum||--Your first category| |--Rules and other junk| |--Hellos and Goodbyes|--General Game Discussuion|--Cheats|--Videos|--Credits|--Fan Art|--Parties and meetings|--Media/Entertainment|--Chit Chat|--Suggestions for Club Penguin|--Advertisements|--Suggestions|--Contests|--Music|--Games|--Funny pics :D|--Questions and Answers|--Annoucnements!